Tadaa! 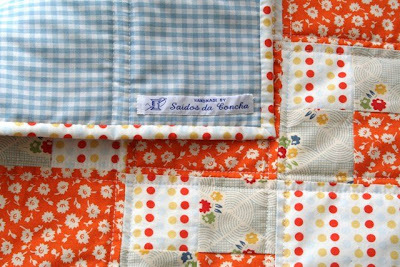 Depois de tanto suspense, cá está o quilt! O meu primeiro quilt! Sim, é pequeno. Não, não sei qual é a sua utilidade. Mas fazê-lo deu-me imenso gozo e gosto muito dele! Tadaa! After all the suspense, here is the quilt! My first quilt! Yes, it's rather small. And no, I haven't the slightest idea what it can be used for. But making it gave me so much pleasure and I love it! Gorgeous! And for a first quilt you've done beautifully. Yippee!!! congratulations. i'm sure you will find a use for it. if not...you can send it to me! yeah!!!! Well done on finishing it, and so beautifully too! But now you've started you'll not be able to stop! the quilt looks great! congratulations, there's no turning back now! 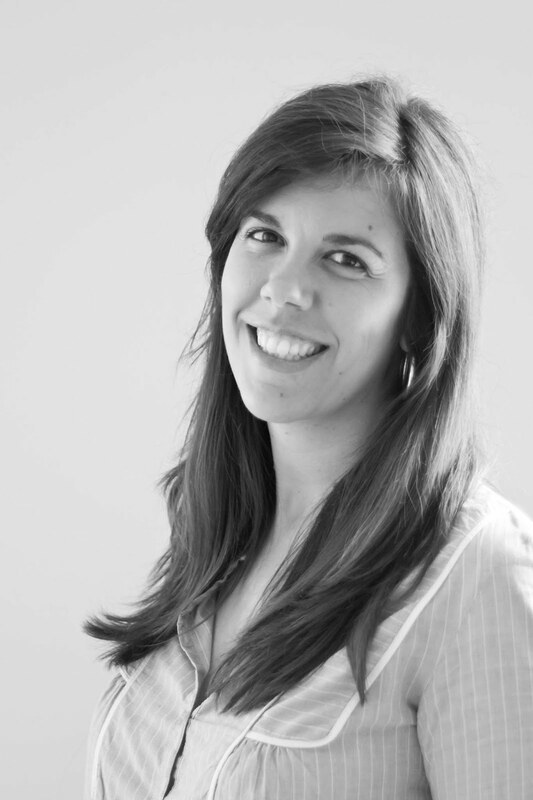 Com as tuas fotos parece tao facil, uma pessoa ate se esquece de todo o trabalho que esta por tras. Ficou lindo! Parabéns! Ficou mesmo muito giro. Também estou tentada a fazer o meu primeiro quilt ainda a tempo do Natal! Parabéns! 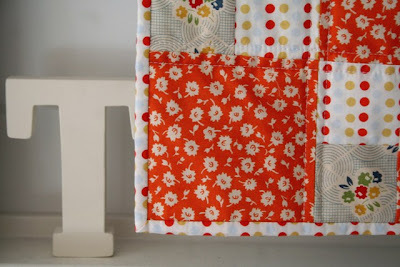 Está muito giro...adoro as cores, os tecidos e o esquema do quilt! Congratulations! It is very beautiful. It is so pretty! I think you could just have it as a piece of art, to hang it on the wall! And always remember your first one! 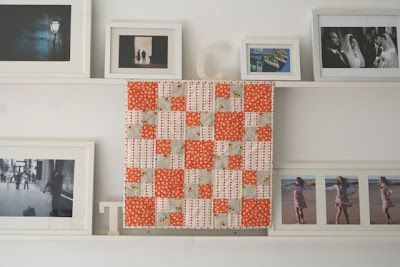 What a great idea to start small for your first quilt! It's gorgeous! I love the dotted fabric with the others. I am revealing how insane I am by telling you that my first quilt turned into a queen-sized monster!! I just about blew out my shoulder quilting it, but it turned out nicely for a first effort. I look forward to seeing your second and third etc. quilts! Parabéns, ficou muito lindo e um doce! E agora que este está feito, o que fazer de seguida? 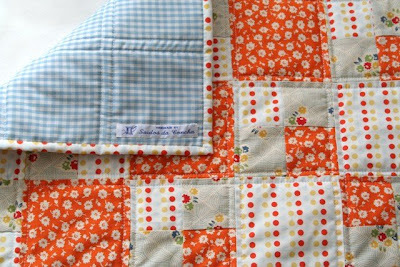 Two quilt or not two quilt? Essa é a questão. Foi feito para ser visto e admirado por muita gente. Aí está a sua utilidade! Very cute -- especially so since it's your first! Wow, Concha! I absolutely love this! It's so simple, but very modern and beautiful. The fabrics are great! 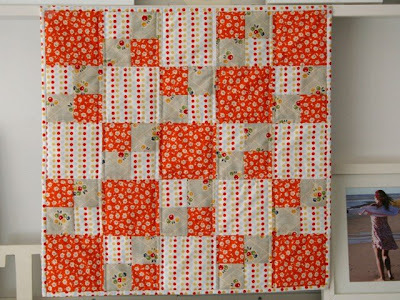 I hope it's okay I shared your lovely quilt with the community at Quiltivate on the Simple Four-Patch block page. Thanks so much for sharing your beautiful work!